On a recent morning drive out of Mata Mata camp in the Kgalagadi Transfrontier Park, South Africa I made the wrong decision, staying with a coalition of four cheetah males. I spotted the four lying in the riverbed under a tree close to the Craig Lockhart waterhole. It was way before the sun was up. After a short while the cheetahs got up and started moving along the riverbed. A few hundred meters on they crossed the road and started climbing the ridge and vanished on the other side. At that stage I should have driven on but I stayed. On the way down only a few hundred metres before I passed a small herd of wildebeest with a few calves. Ok I thought as the cheetah moved in their direction give it a try. I may witness and can photograph some action. As the cheetahs moved out of sight I waited patiently at the wildebeest herd. Always keeping an eye on the dune where the cheetahs had vanished and might pop up again. Nothing happened, I grew restless and wondered what might happen further down the road. I drove up and down, checked through my binoculars the dune for any signs of the cats but to no avail. I went back to the wildebeest and spent some more time waiting for the action to happen. After another impatient wait I lost hope and decided to move on. I left without a single frame taken. I didn’t had to drive far to find out what I missed. Just before the next waterhole, Dalkeith, cars were following a bunch of lions. Later on in camp friends told me the full story. But first back to the lions. They left the road and went up a low ridge. I reversed around the bend and hoped for the best. This time my guess was correct. In a single file the lions came down on the other side of the ridge straight towards me. Quickly I dialled in some underexposure and I got my first images of the morning. I counted the lions as they passed my car on their way back into the riverbed. Three lioness and seven youngsters – quite a nice sized pride. But something was wrong. As the ten ambled along I noticed their nervousness. It looked like if they were on the escape. Constantly the lions looked over their shoulders as if something was scaring them. But what scares a lion? I managed to pull my eyes of the pride and turned around to see what’s happening behind. A male lion came over the same ridge and purposefully walked after the females and youngsters. I trailed the pride of ten while they moved up the riverbed with the male a few hundred meters behind in hot pursuit. Once in a while a lioness or a youngster stopped, looked back, saw the male and started to walk again. This went on for a quite a while. On their way up the Auob riverbed the lions passed some giraffes which didn’t know what to make out of the strange procession. They starred at them in disbelieve. By now it was hot and the male decided it was time for a rest. He slumped into the shade of a tree. The chased lionesses and youngsters did the same and found refuge from the raising temperatures under a large camelthorn tree close by. After a short rest the male got up and again started its pursuit. Immediately the pride got up and were on the go, too. I watched them for a while before I decided to call it a morning and slowly drove back to camp. Later in camp friends told me the full story of the events of the morning. The two pride males were drinking at Dalkeith waterhole as the lioness and youngster came over the ridge down to the waterhole. They greeted only the first male and kept a safe distance from the second. The newcomers had a quick drink while their uneasiness grew. Visibly scared of the second male they made a hasty gateway. After a little while the second male followed and chased them up the riverbed. The first stayed at the waterhole. 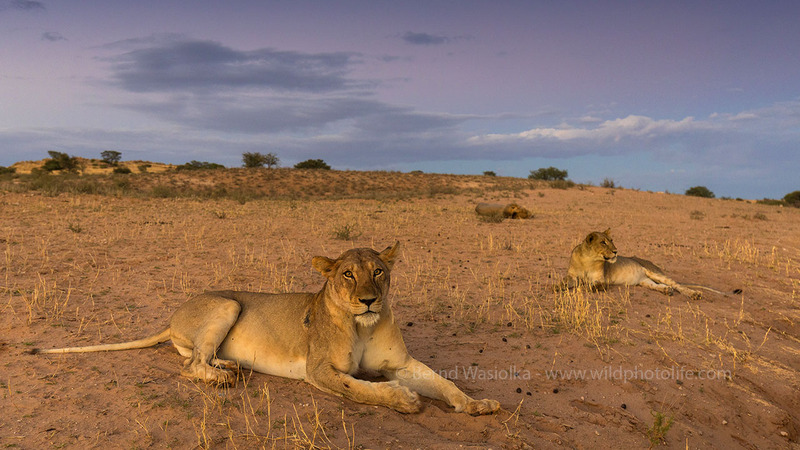 The following morning I caught up with the pride close to Craig Lockhart waterhole. Overnight the first male and another lioness had joined them. The second male was nowhere to be seen. All of them were resting on the side of the road. Visibly relaxed, the tension from the previous day had vanished. I mainly concentrated on the lioness close to me. She was only a short distance away so I made use of my wide angle lens. I was really pleased with the results. I always wanted an image like that (see blog cover image). After a while the male woke up and I shifted my attention to him. As he was a little further away I changed to my trusty 70-200 lens. The first rays of the sun and the clouds on the horizon made for a great image. Only in camp when I had a look at the images on my laptop I noticed the fresh claw marks on the left side of the males face. As he mainly presented the right side of his face and hardly the left side I missed those in the morning. Until I saw the perfectly arranged claw marks I was really happy with the images from the morning drive. But now I had the feeling I had missed an opportunity of a brilliant and unusual lion portrait. Mostly likely the male had a fight with its brother over the previous troubling morning and the chase up the riverbed. During the fight the second male must have pulled a paw through its face and just missed the left eye by a few centimetres. But he left an amazing claw pattern behind. After another two days I had to make my way down to Twee Rivieren camp without seeing the lions again. I wasn’t too happy about the missed chance. But hey another day another chance for an outstanding image. And it came sooner than expected. After 2 days in Twee Rivieren I heard about the giraffe which died between the 13th and 14th borehole in the vicinity of Mata Mata. There was a male lion feeding on it. I decided to change my plans, move back to Mata Mata camp and see what happens with the giraffe and the lion. But this will be another story for another time. After a long introduction we are coming to the point of my story and I will cut it short. On my third morning drive to the giraffe I came across the scar-faced lion. He was resting on the side of the road. My heart jumped, I grabbed my camera and was ready for my desired image. The sun wasn’t visible yet. Nevertheless the first rays found their way over the dunes. The male did me a favour, turned his head and presented me his perfect scars. My camera clicked away and I had my pic. A few seconds later the lion got up and walked away. A quick check on the screen and I was over the moon. I knew this time I had nailed it.